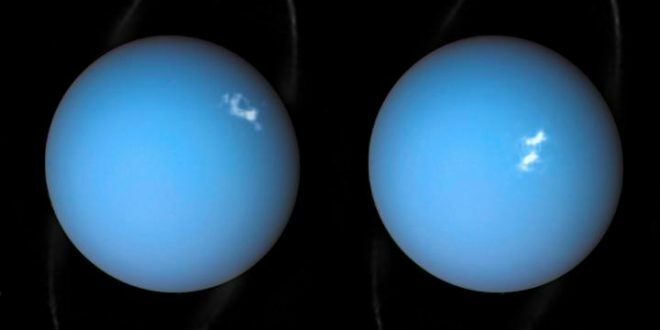 Images taken by the Hubble Space Telescope show two different observations about Uranus: one photo shows the ring and the other shows auroras. The picture, which combines a Voyager 2 image and Hubble’s observations, shows cloud-like white spots where the auroras occurred. NASA’s Voyager 2 spacecraft visited Uranus in 1986 and Hubble has been eyeing the planet’s auroras since 2011. Auroras start as streams of charged particles. “They become caught in powerful magnetic fields and are channeled into the upper atmosphere, where their interactions with gas particles, such as oxygen or nitrogen, set off spectacular bursts of light,” the ESA says. The ESA refers to the auroras as “powerful shimmering regions” and notes they rotate with the planet. You’ll also notice the presence of a ring around Uranus in the image. The ice giant has at least 13 known rings. Uranus may not attract the same amount of attention as its more glamorous cousin Saturn, but it’s an intriguing and still-mysterious member of our solar system.